CAN! Update … March 2018 – CarbonActionNow! Here’s a summary of our progress in March, our second month of operations following the launch of CarbonActionNow! at the end of January. A steady stream of responses have been coming in from those interested in joining the CAN! concept validation pilot, which aims to take a number of action groups through the CAN! process in order to test and improve the process and documentation. March saw significant growth in the number of visitors to the website, including first visits from Argentina, Australia, Belgium, Brazil, Canada, Finland, France, Ireland, Italy, Kenya, Mexico, Norway, the Philippines, Qatar, Singapore, Spain, and Switzerland. We had the pleasure of welcoming a “virtual intern” to the CAN! Team during March. Henry helped us to get set-up on Facebook and Instagram, considerably extending our social media reach. Many thanks Henry for your help in progressing CarbonActionNow! Our Twitter following grew 10-fold during the month and, to celebrate passing the 200 followers milestone, we offset their total body mass plus a bit more, once again using the UNFCCC’s Climate Neutral Now online platform. That brought our cumulative carbon emissions impact to date up to 33 tonnes – just 99,967 tonnes to go before we reach our first major milestone! Our campaign to raise funds for online marketing continues on the YouCaring platform. 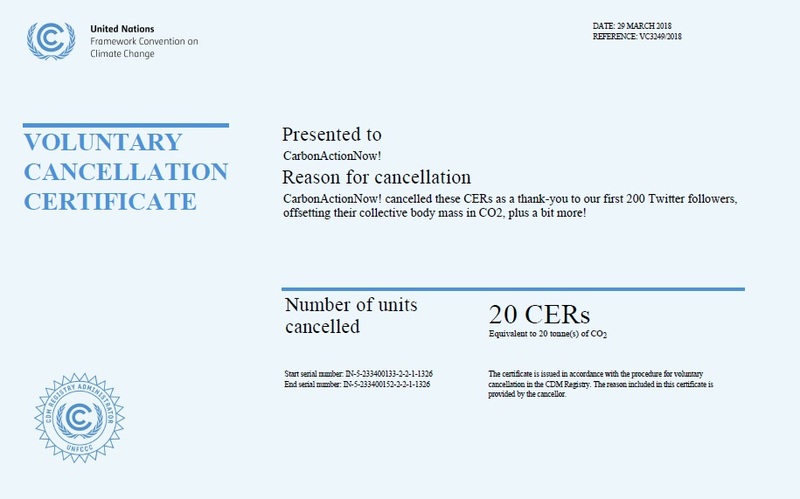 In line with our mission and fundraising policy, 50% of all contributions will be used to purchase and cancel CERs, while remaining funds will be used for online marketing of CarbonActionNow! including the CAN! Concept Validation Pilot. The campaign can be found at www.youcaring.com/theplanet-1110668.